WhatInStartup Portable displays the list of all applications that are loaded automatically when Windows starts up. For each application, the following information is displayed: Startup Type (Registry/Startup Folder), Command-Line String, Product Name, File Version, Company Name, Location in the Registry or file system, and more. 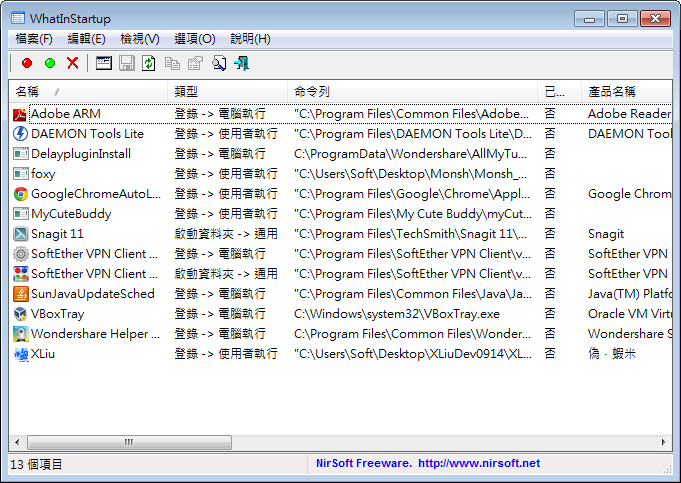 It allows you to easily disable or delete unwanted programs that run in your Windows startup. You can use it on your currently running instance of Windows, as well as you can use it on external instance of Windows in another drive.